Here are some chess web-sites we like. When we have more of them, we will separate them by category. The inclusion of any web-site in our list is not a warranty by CXR. Caveat Emptor! FICS (Free Internet Chess Server) Play Chess Free Internet Chess Server (FICS). Play chess here for free. Face opponents from around the globe. Simple interface. Free to play. Cool Chess Canada Supplies Purveyor of quality chess supplies in Ontario, Canada. Endgame Problems Training A great place to train your brain, by working on a variety of endgame problems. Register for FREE. Red Hot Pawn Play chess A great site where you can play multiple correspondence chess games for free. Terrific interface. Cajun Chess Supplies Major supplier of chess boards, pieces, clocks, software, books, etc. Cajun Chess has the best prices we have seen anywhere! Susan Polgar's Blog News The Queen of Chess, GM Susan Polgar, keeps you up-to-date on all the exciting chess news. An important site. Chess Maniac Everything This site has it all. Everything about chess is here. Links, too. Chess Daily News News The hottest news from the wide world of chess. 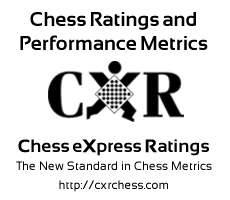 To suggest a link, send an email to: info@cxrchess.com with the word "Link" in the Subject. Include the web-site address (URL) and why you think that CXR customers would be interested in the site.